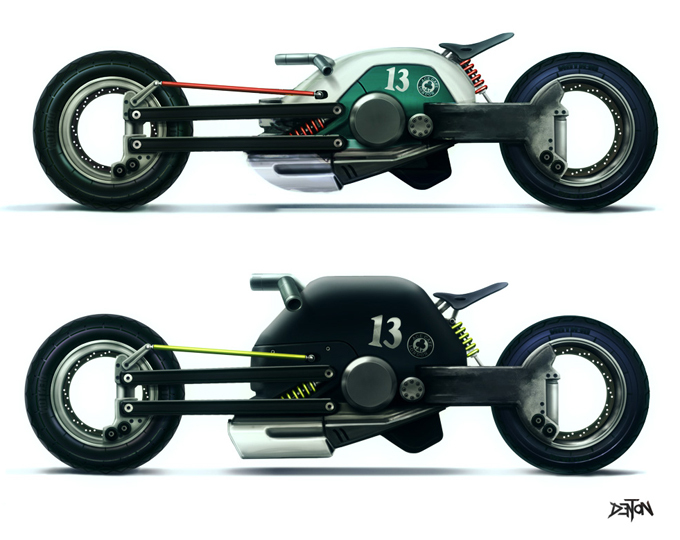 These radical concepts look like they could have been created by maverick designer Phillipe Starck. In reality they are the brain child of young english designer Paul Van Denton. After completing a masters in vehicle design from the Royal College of Art in London he now works for industrial designer Ron Arad. But Paul’s true love is designing motorcycles – a lot of the time in his lunch hour. Paul says he is “unsatisfied with bike designs at the moment” and wants to build nostalgic rides with a futuristic twist. The pictured café racers below may not be very practical with their extreme riding positions but we love their simplicity (although not a huge fan of hubless wheels). Paul is also planning to build a full scale mock-up of one of his bike designs in the near future. Will keep you posted and have the pics when it happens. For now you can check out more concepts on Paul’s blog.